Another week, another stack of books added to the Library of Winkelman. 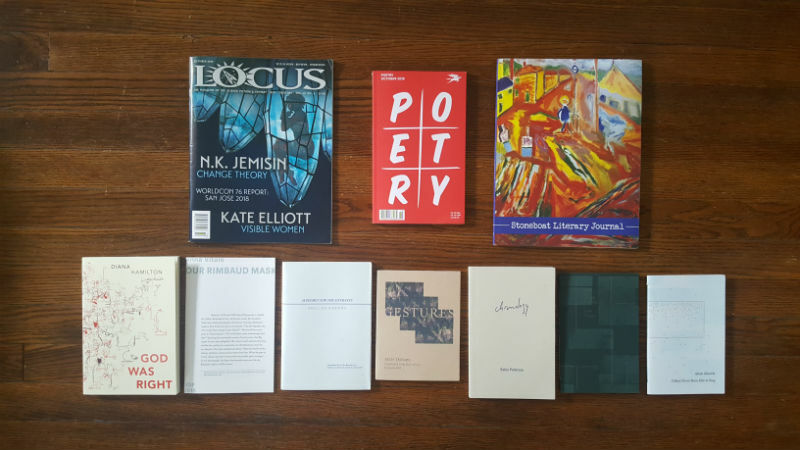 Starting at top left we have the most recent issues of Locus Magazine and Poetry Magazine. I picked them up at my employment alma mater Schuler Books and Music. At top right is a recent issue of StoneBoat Literary Journal, to which I have recently submitted some poetry. While they did not accept my work, I do very much appreciate theirs, so I will be submitting more poetry and fiction in the future. It is safe to say that I am completely in love with Ugly Duckling Presse. Though their annual subscription is expensive, given the quality and variety of work they publish, I consider it absolutely worth the price. LitHub is doing a series of posts on the ten books which have defined each decade for the past hundred years, with a brief essay on each title. Really interesting stuff here! I will continue to update this list as LitHub releases the rest of the pages. Another week, another collection of new reading material. 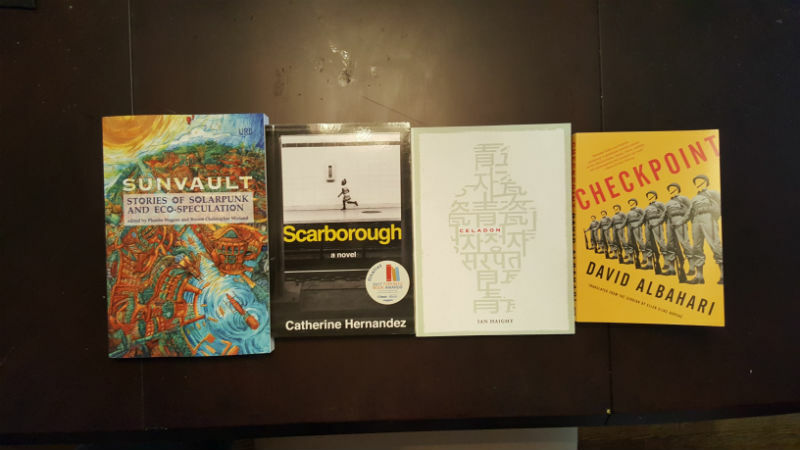 This post is exceptional for reasons I will get to in a moment, but first: the books. Starting at the upper left, is issue 7.1 of Storm Cellar Quarterly, which I picked up for research as a possible venue for submitting poetry. Next is Passing by Nella Larsen, published by Restless Books but not part of my subscription. Restless is doing some seriously good work in bringing forgotten and underrepresented voices into public awareness. Next is the easiness and the loneliness, poetry by Asta Olivia Nordenhof, from my subscription to Open Letter Books. 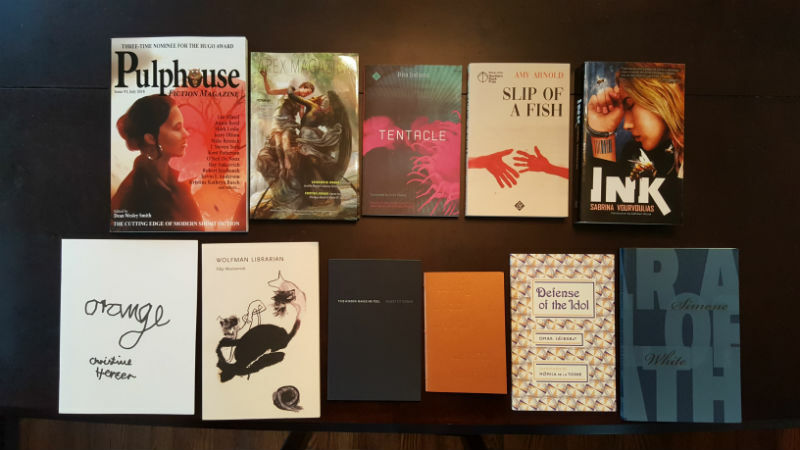 The bottom row is my reward for backing a Kickstarter campaign from Copper Canyon Press to publish Ursula Le Guin’s last collection of poetry, So Far So Good. 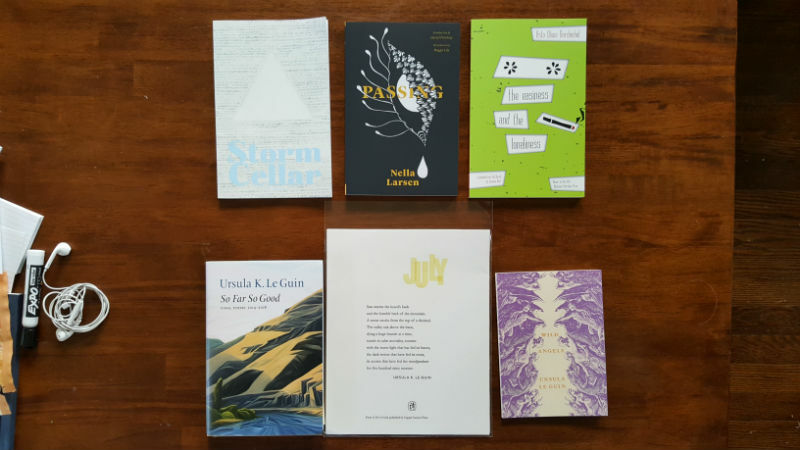 Next to that is a broadside of her poem “July”, and on the right side is a special-edition reprint of one of Le Guin’s early collections, Wild Angels. Le Guin didn’t come into my awareness as a poet until many years after I began reading her fiction, so when this Kickstarter appeared shortly after she passed away I jumped at the opportunity. Copper Canyon continually turns out superlative work and in this they have done justice to the final collection of a magnificent writer.